You are at:Home»Posts Tagged "“Hatsune Miku”"
When the song ends, his reaction is just what you’d hope. The second annual Japan Film Festival at the New People Cinema in San Francisco kicked off during the 2014 J-POP SUMMIT Festival, presenting 19 movies over the course of nine days. Here are seven that are relevant to the interests of the nerdy, and which you should check out if you can. The sixth annual J-POP SUMMIT Festival was held in San Francisco’s Japantown over the weekend of July 19-20, 2014. It was fun and exhilarating and loud and crowded, and full of unexpected and wonderful things. Here are some of those things – and it’s not even all Hatsune Miku, but there’s a lot of her, too. 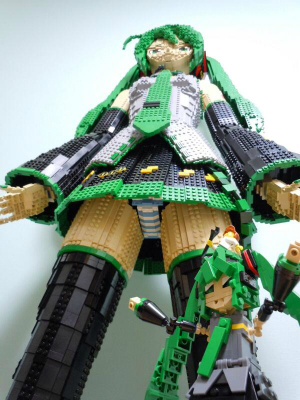 You can’t call this NSFW when it’s a Lego model of a person who has never been real, right? Speaking as a guy who had to cover a Hatsune Miku panel at Otakon some years back, allow me to speak freely and say that Hatsune Miku, and the weird pop-cultural cult around her, is both fascinating and, well, weird.